Are you hoping to have a perfect sharp slicing knifes in your kitchen? Or you want a very good knife for your barbecue or cakes ? Then you need to buy set of cutters ! Do follow up on my tips for more details. We all know there are moments in our life where you need to show the sharpness of your knives. Be it birthday Parties, Christmas or Thanksgiving Day, it’s a no show without a turkey or chicken roast. 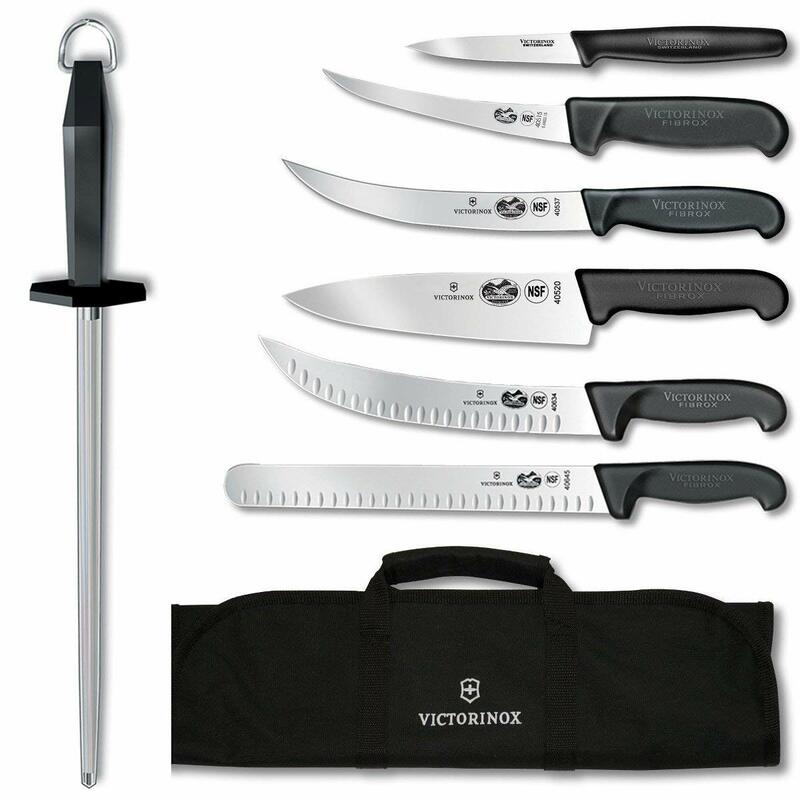 Therefore, there is definitely the need to get the best knives for those perfect slices. Like most people, we wouldn’t want to honour this moment with a coarse slice for friends and family. Most of the people we tagged the best roast sellers in our community are quack without a sharp knife ! And if you are the type that have tried to establish yourself as a slicer and you are not there yet, you need to pay attention and invest in your slicing knife. I can promise you things will improve if you upgrade with some great tools in your kitchen. These knives are very common during festive periods and can be given as presents to family and friends during these times. 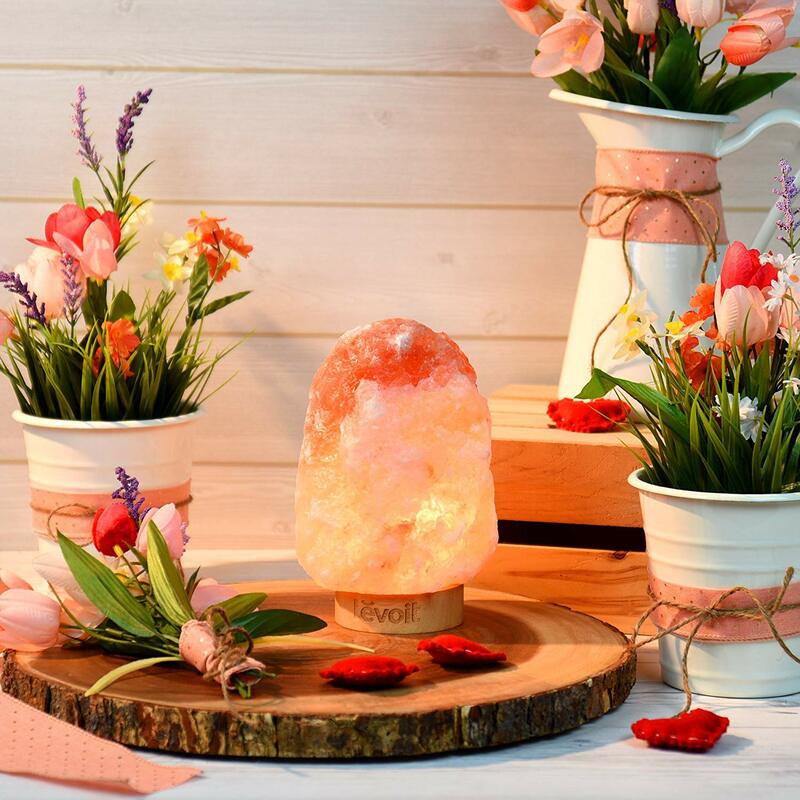 However, adding it to your kitchen will make it more accessible and you can use it throughout the year. I have made a research on the knives and I am ready to present our conclusions. Kindly read this text, and this will put you in the right direction on which is the best slicing knife for your kitchen. A carving knife is not the same as the slicing knife. 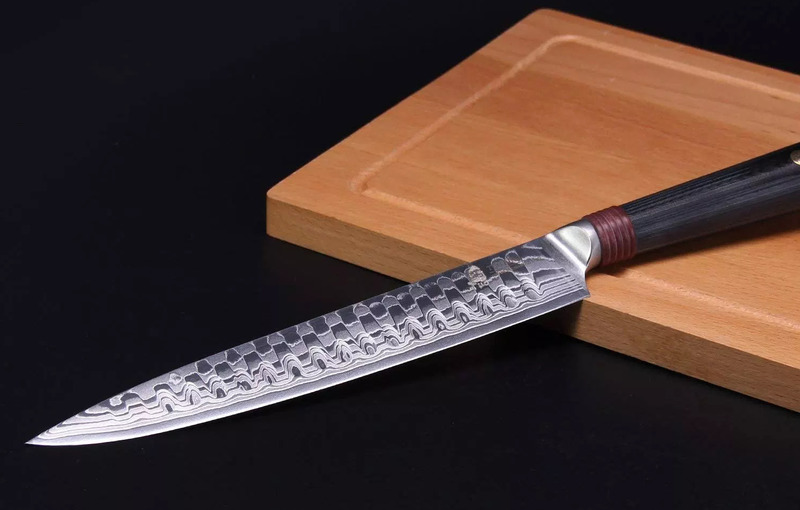 A carving knife is designed to make beautiful slices meats and the blades is 8-10-inch long and the blade starts full from the handle and gets narrower to the tip. A slicing knife is lengthier than a carving knife and the blades is 12-14 inch with consistent width. They both look similar, but they have different purposes in the kitchen. What to Consider When buying The Best Slicing Knife? There are many factors you need to consider before buying a slicing knife. It is important you know that the key to having an enjoyable roast cuts is possessing the best possible slicing knife. So in order to fulfil your dream of getting the best one follow carefully the below. The first thing is to determine what your needs are and what you’re planning to use the slicing knife for. A Specialized baker needs and requirement differs from an individual because he will be using his/her knife on regular basis. So he might be considering much more details than an individual.When you have been able to make a choice and you’ve sorted out your plans, the kind of knives that will be suitable for you would have been discovered. The length of a slicing knife needs to be long enough to cut through a large roast in one stroke. A usual knife is about 12” long but any length between 8” and 15” is considered to be fine. A knife would cut your roast properly if it is too short. There is a unique features associated with the blade of the knife that makes the cutting easier and efficient. 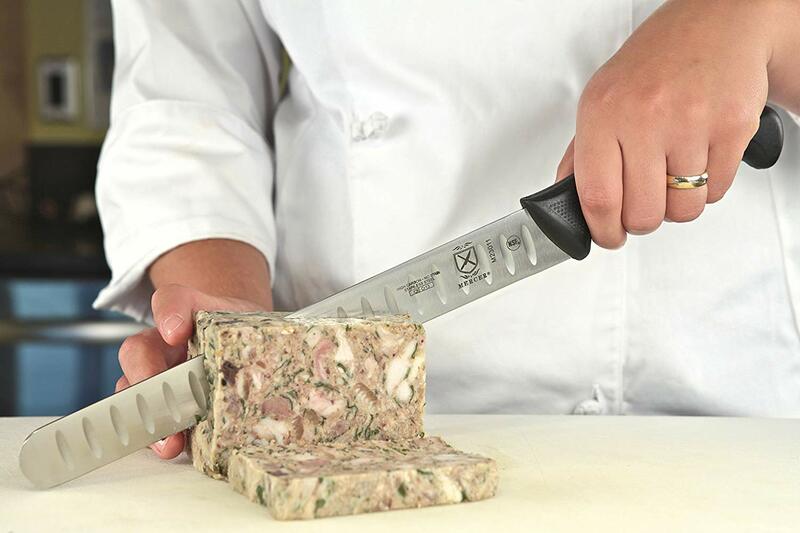 The serrated blade features ridges, lessen Friction and Prevent Food from sticking to it. The recommended type of blade when it comes to slicing is tagged “Granton blade”. The best choice of material for slicing knifes is Stainless steel. It is durable, easy to maintain and clean. 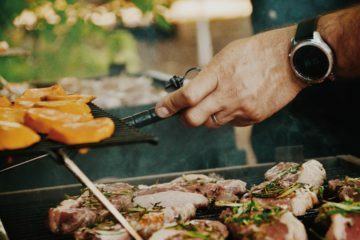 Research proved that a carbon stainless steel can also be adopted as it is more durable than a knife made from stainless steel alone due to the addition of carbon elements. 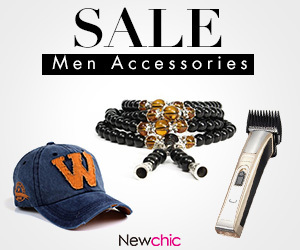 The handle should be made from a durable material as well but also provide for an easy grip and secure hold. The meat needs to rest for twenty to thirty minutes before cutting so that the juices can redistribute and the slices remain juicy.Cutting roasts must be done against or across the meat grain as that will make the meat less tough. A slicing knife is not a saw, hence you need to slice with a full length and in one direction only.Do not use a knife with a serrated edge (except the Granton Edge blade, of course) as this can tear the meat.To have a uniform cut, always hold the knife at the same angle every time you slice meat. After cutting, prepare a warmed plate to put your slices. The extra meat juice can be spoon over the slices to keep them moist until served.A meat fork is encouraged to use to keep the roast from moving. Large chunks meats are firmer and easier to handle too but the medium-roast are the easier to slice.The best of roast slices are ¼ to ½ thick. It is as sharp as a razor and has the ability to cut in one drive. This slicing knife is greatly valued among professional cooks and chef due to its sharpness and versatility. Not only that you can use it to cook, but you can also use it to cut other food items. It is as sharp as a razor and has the ability to cut in one drive. Like some other blades, the victorinox knife also features the Granton blade which will prevent the roast from sticking to the blade. The knife is approximately 17” with a handle and the blade size is 12”. Been long makes it easier to cut in one stroke and this is one of the major reasons it is highly appreciated. Talking about the handle, it is firm and easy to handle although it is made from plastic. Despite, the knife is stable and nice. This knife has been tested several times to cut roasts, cakes, meats and raw food and its performance is great. The knife has not guard or sheath, therefore one must be careful in handling the blade to avoid kitchen accident because it can’t cut anything on a stoke. It is a very sharp blade. It is very easy to tidy and wash.
Material is environmental friendly and no defects. It is long and great. It has no sheath or guard for safety. The length can be a problem while storing. It is made from precision forged German steel. This edge slicing knife features a high-quality Granton edge blade and has a rounded tip just like Victorinox. It is made from precision forged German steel. It is not so expensive and can be afforded. However, the edge is a bit shorter but it is safer and its handle is triple-riveted for extra comfort and stability. 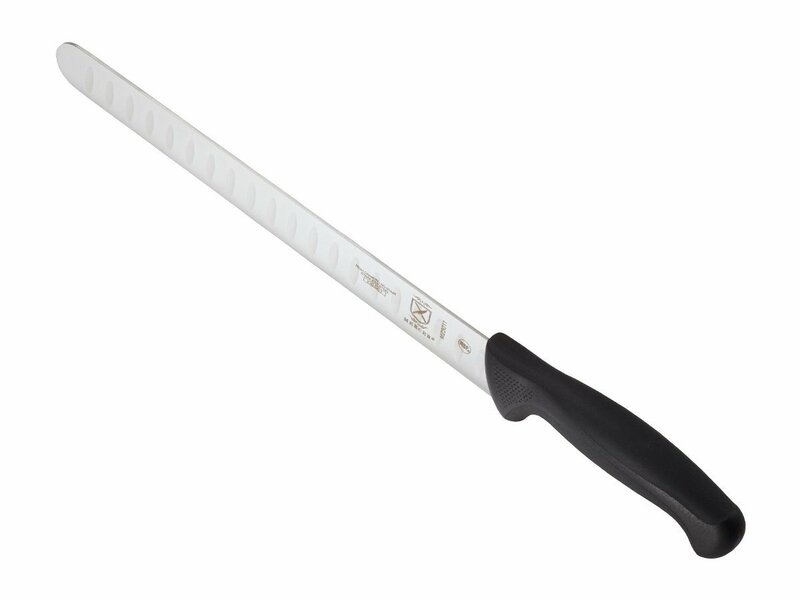 The slicer safety was considered during the design and fabrication of this knives and hence the handle is furnished with both textured finger points for slip-resistance and a protective finger guard. The major issue with this knife is that it is not so long and that it requires sharpening sometimes. Considering the price, the handle, and the materials of production that will not rust, it is still a very good type. The blade made from the highest quality Japanese Steel. The length is okay for multiple users. The handle is durable and Superior. The blade dulls rather quickly and needs to be honed. It is short and might not be useful in some instances. Damascus stainless steel and high carbon soft steel and this is the secrete behind its durability. This knife is made from premium AUS-10D Damascus stainless steel and high carbon soft steel and this is the secrete behind its durability. If you are the type that really fashion beauty and flexibility, then TUO Cutlery 9 inch Slicing High-Grade Classic slicing knife might be the thing you are looking for.The transition from the design to fabrication and packaging is top notch. The handle is lavishly decorated G10 handle and the blade is as sharp as razor. It is both cold and moisture resistant and this means that it is far from rust. The handle is tagged to be military grade and this modify its strength for extra durability. The handle is heavy in relation to the blade and can be frustrating sometimes. The knife is suitable for both carving and slicing and has been tested several times to cut roasts, cakes, meats, fruit, vegetables, and raw food and its performance is great It can also be a great gift for your loved ones due to luxurious packaging. If you don’t like it, then, you can opt for other types. G10 handle decorated with a beautiful mosaic. The handle is too heavy. 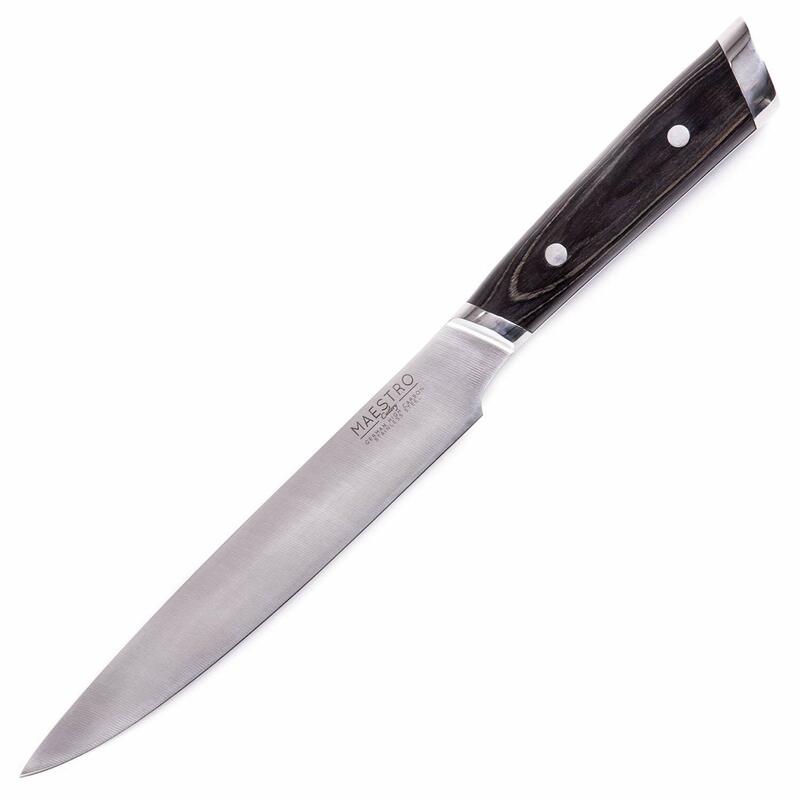 Maestro Cutlery Volken Series 8” Inch Professional slicing knife is made from both stainless steel and high carbon steel. It is hard, strong durable due to the carbon content, rust and stain-resistant, and easy to maintain. With this knife, you can achieve your dream of having a very good cut of roasts and cake.The knife is not just easy to use but also easy to maintain and the handle is made from plastic. It is advisable to wash by hand, as a dishwater pressure can be too high for the blade and this will make it dull. 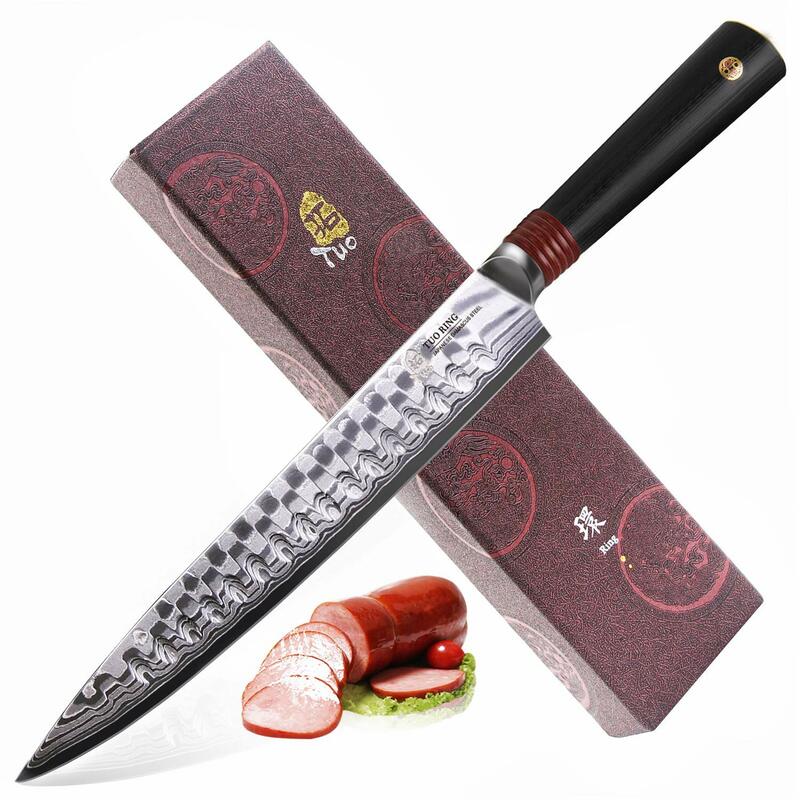 The knife is heat and water resistant and the handle has a black-wood design which makes it safe and easy to handle firmly.The roast meat can be cut effectively, and also other ingredients. It has a great cutting control and stability. It is affordable and safe to use. The length of the blade (at 8 inches long) can be a major concern because these might be too short for bigger roasts. However, the sharpness and efficiency is superb. 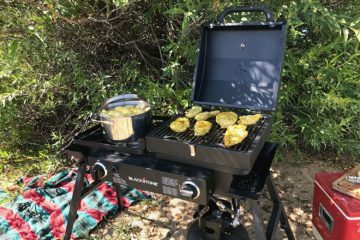 It has double-riveted handles for extra stability. This is the best and the most expensive of all the knives and what it can do justifies why it’s so expensive. 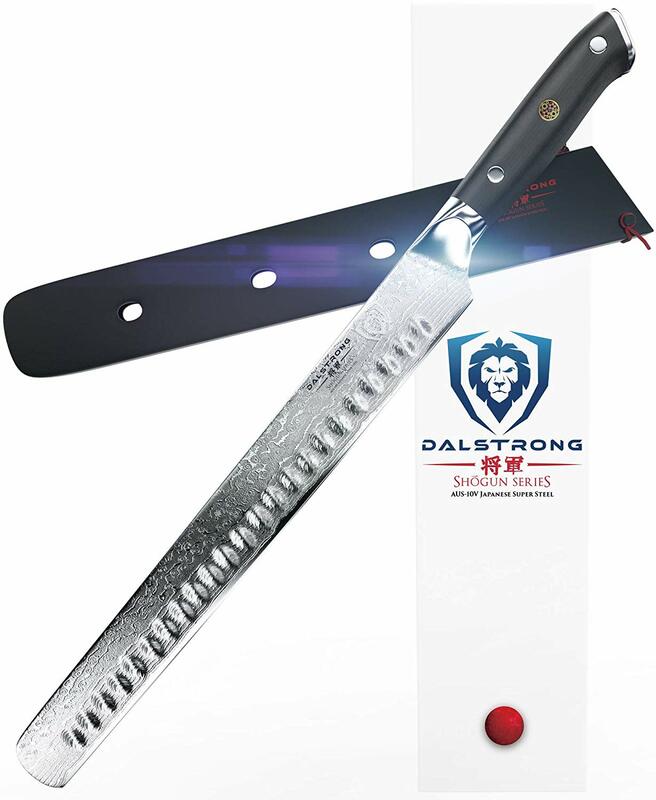 DALSTRONG Shogun Series slicing knife features a 12″ long blade angled at 8-12°degree and sharp as a razor.The knife is flexible and can provide you perfect and nice cuts of your roasts. It is also made from premium high-carbon stainless steel and this satisfies why it is durable and strong. It is long enough to cut through even the largest roasts almost effortlessly.It also suitable for prepping large fruits and veggies and even desserts and baked goods. This blade comes with a sheath or guard for the blade to avoid kitchen accidents and this makes it easy to use, maintain and handle. The handle is military grade, moisture proof, cold and can last as long as the blade. It is so easy to control and it gives the comfort needed when slicing. AUS-10V Vacuum-Treated Japanese super steel cutting core. Comes with a guard to protect the blade when not in use. The blade tends to dull too quickly considering the price. To be frank, TUO Cutlery 9-inch High-Grade Slicing Knife is the best slicing knife due to its flexibility, toughness, and superior cutting effectiveness. 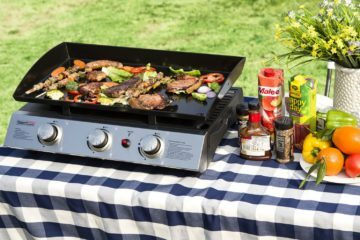 Generally, any of the reviewed knives will satisfy your needs and a perfect roast slices are assured!